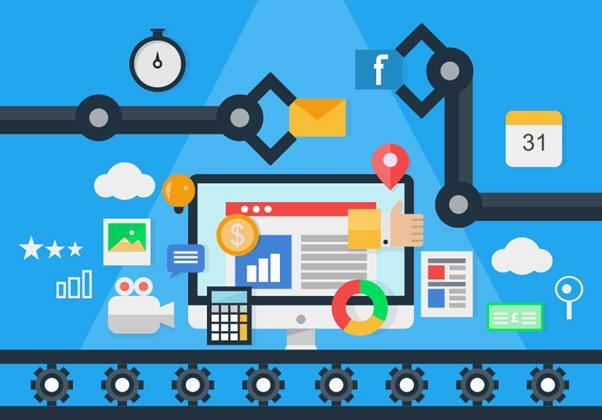 Put simply, content automation is a method of generating great copy for your webpage based not on the work of a writer but that of a machine. When machines take jobs from humans it can be depressing; the end of an era, the loss of a livelihood and the termination of a career path many decades old. Whether it’s Otto’s self driving lorries that signal the death knell of the trucker or Blackstone Discovery’s analytical software that sifts through thousands of legal documents far quicker than any lawyer, we all fear for our jobs. Even the humble content writer composing an article like this is not immune. So what’s it all about? How is content automation good for your company and does it really put an end to the human element? Great content has never been more important to a company website. It’s what drives traffic, generates leads, instigates conversions and keeps your audience coming back for more. It’s also vital for your website’s ranking. Google says that content is “one of the most important steps in improving your site’s ranking in Google search results [using] plenty of rich information”. Google hits sites hard that use poor copy such as that from content spinning farms where articles are regurgitated in cynical attempts to gain traction and for site owners to cut corners struggling with their content budget. Content automation is a relative newcomer to the scene and relies on an algorithm and formatted data. The algorithm takes a pre-styled template and feeds the data into it. For example an article about weekend match results in a football league could include which team is now top of the division (team with most points), which result was unexpected (comparing past performance with latest results) and who was the best scorer (most goals scored by a player). When it comes to best scorer, a superlative could also be added depending on the number of goals scored; 3 goals could have the player referred to as ‘the outstanding [player name]’ for example. The algorithm could decide on which results were the most important based on previous matches and team positions. For instance, a team in a promotion position or relegation position would be ranked to be mentioned more highly than a team mid-table. Unlike their human counterparts a content automation system can generate a complete article in less than a second. Built-in orthographical software ensures spelling, punctuation and grammatical errors are a thing of the past. Stories that wouldn’t get covered for budget and expected-interest (niche) levels can be generated. For example lower league and amateur football teams can be covered. No spin, no bias; the story is all about facts pure and simple. Smaller organisations can have a much larger content output than would be traditionally expected. This is can be significant boost to their footprint and authority among their rivals. The preceding points are reasonable on paper but in the real world things aren’t as simple. Content automation relies on formatted datasets to operate properly. These take time to prepare so although an article can be generated quickly it’s not real-time. Lou Ferrara, late of the Associated Press, commented that “automated reports almost never have grammatical or misspelling errors and the errors that do remain are due to mistakes in the source data”. The adage of GIGO – garbage in, garbage out – is particularly fitting with content automation. The system is only as good as the algorithm and data; errors in the code, facts, spelling, will all contribute to a poor article and one which will almost certainly stand out as not being written by a person. When it comes to objectivity the article will hinge on the template and the quality of the data. Are they free from bias, or as free as realistically possible? Just because this tool allows us to produce endless amounts of content does not mean we should – this comes back to need. There is no doubt that smaller companies benefit from having access to the creation of a huge amount of content at a low cost but this has to be balanced with need and positioning in the market space. Content creation has to be managed and directed if it is if to be of use. Here are five of the most popular types used on the web today. Managing content requires thought to be valuable. When resources are limited the smaller enterprise can benefit from creative thinking, reusing and repurposing one piece of content. For example, a well planned video interview with an industry leader can be transcribed, broken into subject areas, quotes, tips and nuggets of wisdom. Parts of the interview can then be repurposed into a series of blog posts, the tips can be published as Tweets or released as motivational Instagram quote posts and conversations can be started on social media platforms like Facebook and LinkedIn. Segments could be released on SlideShare. This can then go full circle and be turned into a downloadable eBook complete with comments received from the audience: one great piece of content, repurposed, repackaged and making a long-lived memorable impact with free customer participation and input. This summer’s Olympic Games saw 78 countries participating in 306 events where over 11,000 athletes competed for 918 medals across 28 sports in 33 venues – in short, a lot of data. So it was little wonder that news organisations would struggle to report on everything. Step forward the solution: Heliograf for The Washington Post and Xiaomingbot for Chinese search engine and news outlet Toutiao. 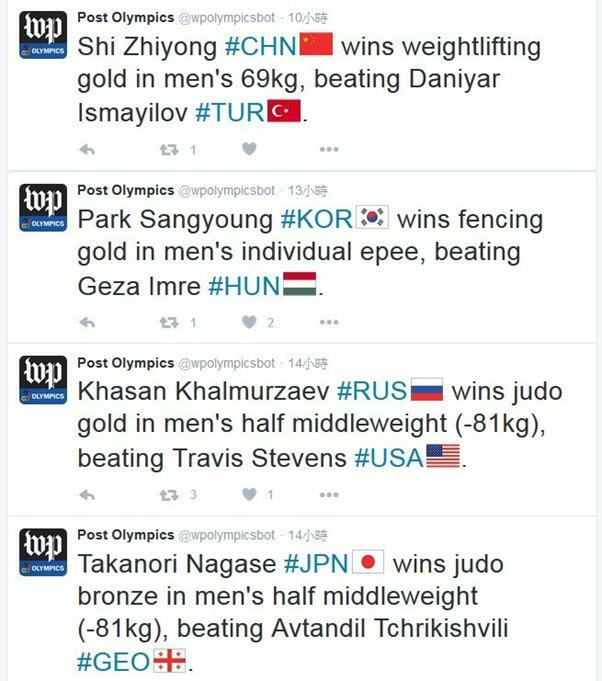 These artificial intelligence bots reported on events throughout the 31st Olympiad; Xiaomingbot racking up 450 articles over 15 days. Currently the human author has the edge over content automation software; the ability to inject wit, make connections and bring the emotional impact to the fore sets us apart. But a new generation of artificial intelligence is snapping at our heels. NLG is the next step at producing reports that read more like a human has prepared them. Currently the companies in this space are Narrative Science’s Quill Engage and Automated Insights’ Wordsmith. 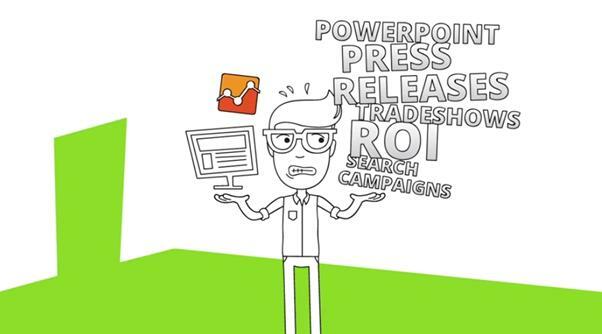 Quill Engage links to your site’s Google Analytics data and presents a weekly report of actionable content that cuts through the morass of graphs, pie charts, maps and figures to produce a simple-to-understand report. For example you might read ‘Your top social referrer, Twitter, forwarded 65 visitors, an increase in performance for the fifth straight week’. This handy, concise report can be understood by all departments without requiring any special training. What’s more is that the software is free! 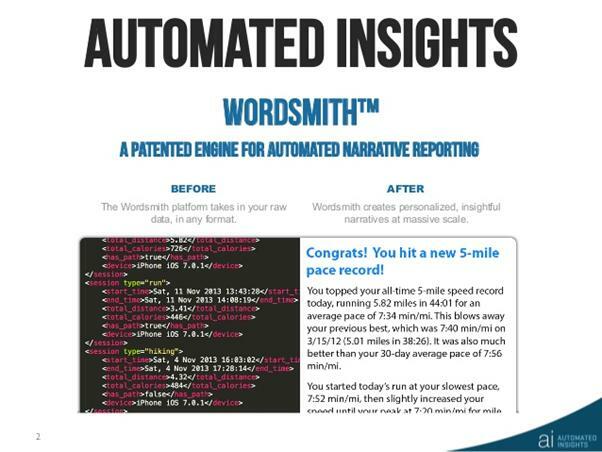 Automated Insight’s Wordsmith is an NLG tool that goes a step further in the readability of articles. The company pronounces that it “Goes way beyond plugging values into static sentences using rules and dynamic synonyms.” In the States, the software is used by the Associated Press (AP) to produce 3,700 company quarterly earnings articles, an increase of 1,200%. “The stories retain the same quality and accuracy that readers expect from any of AP’s human-written articles”, comments the AP. Contrary to what might be expected, this content automation software was not met with too much resistance. In fact, according to Philana Patterson of the Associated Press, “the reaction has been positive from staff, largely because automation has freed up valuable reporting time and reduced the amount of data-processing type work they had been doing”. By giving a repetitive, number-crunching, job to the software, the journalists were able to focus on stories more suited to the human perspective. How often do you login to your favourite website and see content that is of interest specifically to you? Popular streaming services such as Amazon Fire TV and Netflix are a case in point. They remember what you watch then personalise your experience by suggesting shows and movies that you may like. Simple algorithms sift through all of the available content, take your viewing history and compare it to other customers who have similar tastes then present a tailored selection just for you. Shopping websites apply a similar method: when you first login you will see suggestions and items from categories you have bought from in the past or have recently looked at. The experience continues as you browse, each page carrying sidebars of potential purchases all designed to lead you into the sales funnel to buy products. By utilising a rich web experience that flags up recommendations of products that the customer would classify as ‘likes’ or ‘needs’, the greater the likelihood that this will translate into a conversion. This type of content automation is important as customers that get bombarded by products that aren’t of interest are likely to go elsewhere. Even worse would be a site that displays products or services that are offensive or annoying to the customer: for example a recipes site that displays meat-based recipes to a vegan or peanut-based recipes to a nut-allergy sufferer. Traditional marketing using cold-calling and unsolicited emails gets little traction today. However, a cleverly targeted email to potential customers such as those who have joined a mailing list or abandoned their shopping basket can see those people activated and moved further down the sales funnel. 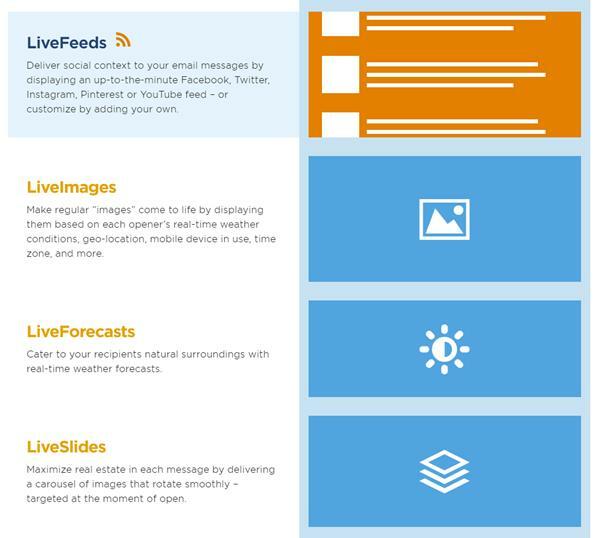 Dynamic emails allow for real-time data to be used as soon as they are opened. For example, if you run a business that offers next day delivery on items if ordered before 1pm you can combine that with an abandoned shopping cart. So then, if the user opens the email in the morning an image of the goods together with a slogan of ‘Buy now, receive tomorrow!’ can be displayed to encourage the user to complete that purchase. The dynamic email can also show the reader items similar to what they last looked at and also how many are left in stock, perhaps enough of persuasion to buy. Liveclicker is one of the dynamic emailing companies at the forefront of the technology. Its software allows you to add a range of dynamic content that plays on opening. The ‘weather’ option can be combined with the location of the recipient and could suggest buying a specific umbrella (that may also happen to be on special offer) saying that it looks like rain tomorrow for instance. “Delivering real-time content solves business issues by keeping emails up-to-date, no matter when, where or how they are opened. Content is instantaneously adjusted to dynamically personalize every email for every recipient”, says Justin Foster of Liveclicker.